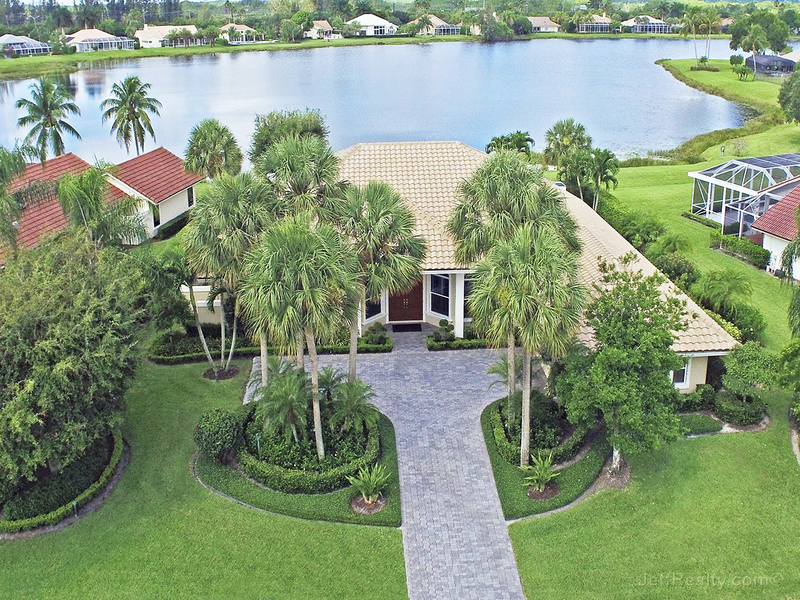 Brilliant and panoramic lake views from this stunning, completely remodeled, 1-story home with the sought-after southwestern exposure at 192 Thornton Drive in Preston at PGA National. From the moment you walk through the double-door entry, the incredible views are captivating and unusually private. No expense was spared renovating this spectacularly open & bright, split-bedroom floorplan home with volume ceilings. Tastefully designed with beautiful Brazilian cherrywood flooring, gorgeous crown molding, and 6” designer baseboards, the home feels as if it is brand new. The kitchen has been constructed to perfection with quality materials such as granite and stainless steel. No matter the weather, enjoy the outdoors year round in the expansive 32×22 sunroom, which leads out onto the tumbled-marble paved patio. 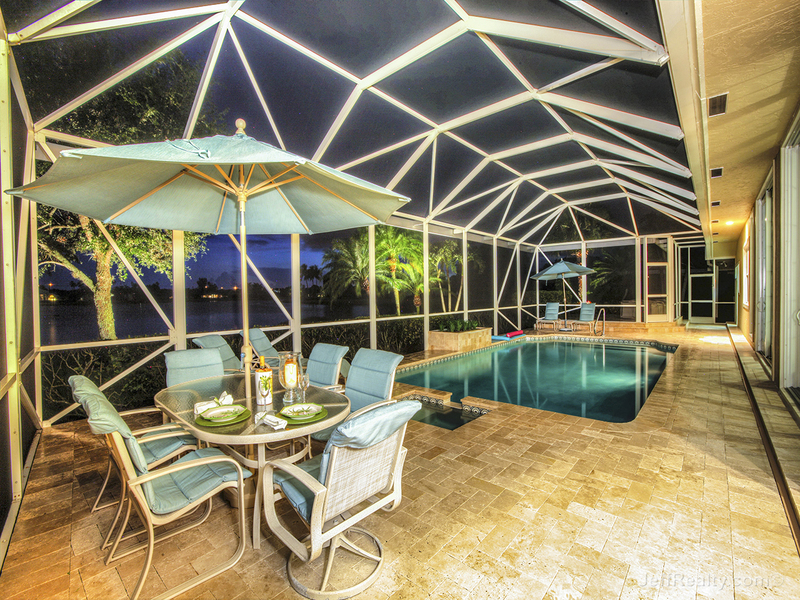 Enjoy the early evenings on the open patio while watching the stunning sun set right before you. The fabulous kitchen has been outfitted with only the finest quality and craftsmanship. Detailed with polished-granite countertops and a pillow-top subway tile backsplash, these cabinets are gorgeous. Expanding to the ceiling, the top of the cabinets are French door style glass doors with separate lights for each. All cabinet doors and drawers are self closing. The chef will appreciate the top-of-the-line appliances, including the Jenn Air, commercial 6-burner stove with exhaust and the large French-door refrigerator. Right off of the kitchen and family room is a lovely breakfast area with large sliders to the sunroom which offers soothing views. Providing ample space, the dining room is ideal for hosting a formal dinner party and features custom plantation shutters for the two picturesque, arched windows. Incredibly cozy, the family room features amazing Brazilian cherrywood floors, beautiful built-ins (TV included), and recessed lighting. And don’t forgot the stunning lake views! Re-designed to take advantage of the outdoors year round, the oversized sunroom is 32×22 and offers priceless lake views. With high ceilings and a complete wall of impact-glass sliders, the natural sunlight illuminates every inch of this room. Flooring is 18″ tile set on the diagonal. The lovely master suite features high-end carpeting, gorgeous crown molding, and opens onto the bright sunroom. Incredible master suite bathroom! Featuring a large, stunning walk-in shower with a mural wall and butted glass, this bathroom is spa-like. Re-designed with separate His & Hers vanities with marble countertops and water-closets featuring a bidet on her side, this bathroom is perfect for two. Suited for royalty, the closet designed especially for Her is a stunning 18×12 and offers a French built-in wardrobe. The guest wing is made up of three spectacular private guest rooms. Two rooms enjoy beautifully lush landscape views and share a Jack-n-Jill bathroom, while the other guest suite features incredible built-ins (could also be an office) and a private bathroom fantastically remodeled with quartz countertops and a rain shower with pebble flooring. This bathroom can also be used as the cabana bathroom. Offering Florida’s most sought-after southwestern exposure, the sunset glistening on the magnificent lake is an incredible way to end the day. The lap-style salt water pool with a spa, which is heated by gas, is perfect for a night swim. Notables: 3 built-in TVs, entire home of Thermopane impact glass, central vac, water filtration softer system for entire home. 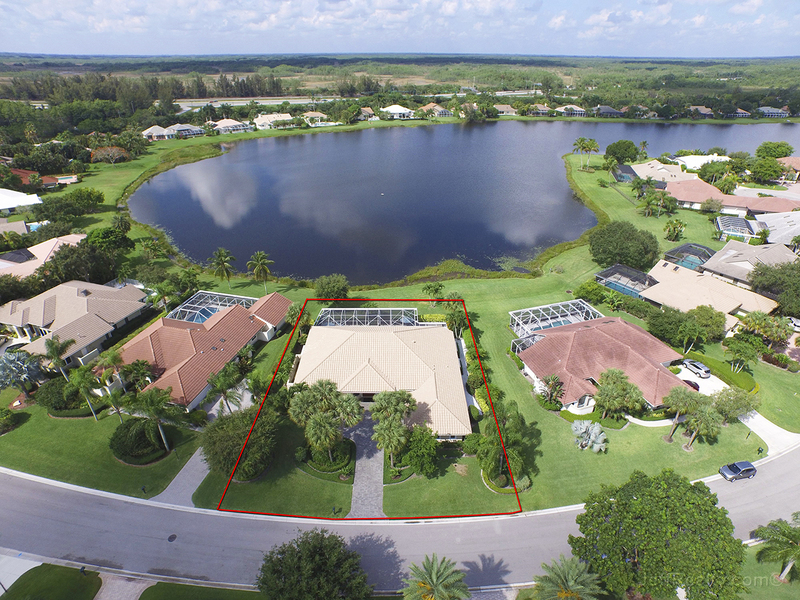 Posted in PGA National, PGA National homes, PGA National homes for sale on June 2, 2015 at 4:44 am. How Do I Sell My Home With A Renter In It?